Is that we often move forward with this unfounded belief that we’ve covered all the angles. Beginning with an attitude of ‘we have all of the answers’ is almost undoubtedly a forecast for a storm brewing on the horizon. It sets the stage for arrogant disillusionment and disappointment in the end. No matter how well thought a plan may appear to be, there is always going to be unforeseen difficulties along the way. An inability to recognize and understand this up front, can often doom leaders and their organization from reaching any type of positive outcome. And without course adjustments, “achieved failure” will be what is waiting at the end of the line. We have to be willing to look at our assumptions, our perspectives and even our inflexibilities. Otherwise, executing what you’ve determined to be the perfect plan can and will end in utter disappointment and failure. No matter how much planning and precision went into the execution of the plan. More than ever, we live in chaotic and turbulent change world that requires reflective leaders who can show the courage and vulnerability to not believe that they have all of the answers. And while the vision may remain the same, any illusion that there is a straight and linear path to this outcome, is deeply misguided. Don’t be afraid to trust your plan. Just be willing to trust your people even more. Remember, nothing is written in stone anymore. If educators struggle with one thing, it’s simplicity. We can easily turn a one page strategy for next steps into a binder of change in the blink of an eye. We do much better with addition, than we do with subtraction. And that can be frustrating for our people and our organizations. Especially in a world that has become more chaotic, more turbulent and less stable under the rate, force and speed of change. Too often we get more, when what we actually need is less. Too often in education, we are purveyors of complexity, rather than designers of simplicity. We need to learn to take a nod from many of the creative and innovative thinkers of our time that have learned to strip their work down to simplistic genius. Think of Steve Jobs, Jony Ives, the Kelley Brothers, and Tim Brown, just to name a few. Just understand that this is not about oversimplifying the complex, which can often happen. This is about engaging the empathy necessary to not incorporate unneeded and unnecessary complexity, even though it is often in our nature to do that. Complexity has a tendency to come much easier than simplicity. And it is that word (empathy) that plays such a vital role in moving our work in this direction. Unfortunately, we can be a bit limited in our understanding and incorporation of this term. Too often we see it as a ‘soft’ term and lump it in with sympathy. We see it only as a way of feeling. However, empathy is much much more. It is a perspective. A way of seeing. A lens that we put on to improve not only the value of what we create and provide, but to determine if our work provides value to the user and improves and enhances their work and experience. Too often, the work we create is based solely on the perspective of the producer, and fails to incorporate the perspective and experience of the user. Which is often a main point of contention, where breakdowns in clarity and commitment occur. Leading to frustration on the part of the creator and the user. When empathy is lacking in the creative and innovative process, we try to do and add too much. We don’t know when to stop. Often working in silos to create what we believe is the ‘perfected’ product, only to be met with concerns, complaints and criticisms. Instead of shipping early with small, incremental experiments with feedback loops that allow us to improve our work and enhance the user experience and needs on an ongoing basis. We try to push out a ‘perfected’ product that leads to two-way frustration. Empathy moves us out of that mindset, out of the meeting room, out of the office, and out to those who our work affects the most. It moves us into physical space where empathy can be engaged to determine the value, usefulness and effect of our work. Empathy removes the pride of holding too tightly to our ideas and envisioned outcomes and moves us towards deeper understandings and recognizing that value is not determined by the producer, but by the user. To realizing that value is created by meeting user needs and effectively generating a useful experience that enhances their ability to do their work better…and easier. And shouldn’t that be the goal of our work, anyways? In some ways, we still see creativity as a bit vague and ambiguous. We remain a bit hazy and unclear on exactly what it is and where it comes from, which can allow us to buy into the many myths and untruths that surround it. And for some, these myths and untruths can become deeply internalized, often causing an abundance of avoidance behaviors. Too often we can see creativity as a disruptive force. Especially if we buy into those myths and untruths that surround it. Which has allowed us to create this internal belief that creativity is about wild abandon and complete freedom. We engage this notion that creativity lacks any restraints or limits. Which produces pictures of chaos and disorder dancing through our heads when we invoke images of creative and innovative spaces and environments. Notions we persist in entertaining in the face of current research. What we’ve come to realize and understand is that creativity is not engaged at it’s highest level under conditions of unrestricted and unlimited freedom. These environments actually have a tendency to hinder and depress our idea output. Rather, it has been shown that our creative faculties are better induced when some sort of constriction or constraint is introduced into the equation. It actually evokes more creative and innovative thinking. Which is far from the chaos, disorder and messiness of unrestrained freedom that we often associate with creative and innovative environments. In all actuality, when we study some of the most creative and innovative people and environments we are met with terms, such as; habits, routines, discipline, persistence, motivation, and focus. Terms that we seldom associate with chaos and disorder (not to say that all creative and innovative people, spaces and environments include these attributes). But what we’ve come to realize is that much of our creative and innovative output is born out of disciplined persistence and the ‘creative habits’ that we incorporate into our lives and work on a daily basis. That creativity often gains a greater flow when we incorporate anchors (habits) and parameters (constraints) to the process. Which stands in stark contrast to those many myths we still rationalize and believe. It is that idea, that notion of the ‘spine’ that keeps us focused during our creative and innovative work. It keeps us from wandering aimlessly. It allows us to keep an eye on our outcome, especially when the process itself has a tendency to overwhelm. It keeps us persistent and disciplined. It keeps us from losing our way towards what we were originally trying to capture with our idea or thinking. Creative work can be engaging and fulfilling, so much so, we can get lost in the work and lose the intention of what we are trying to do, what we are trying to say, what we are trying to accomplish. When our work lacks that ‘spine’, that anchor Tharp refers too, we can struggle to know when to stop, to know when it’s time to ship. For in the end, while creative and innovative work can be deeply satisfying and enjoyable, we are engaging for a reason, for an outcome. 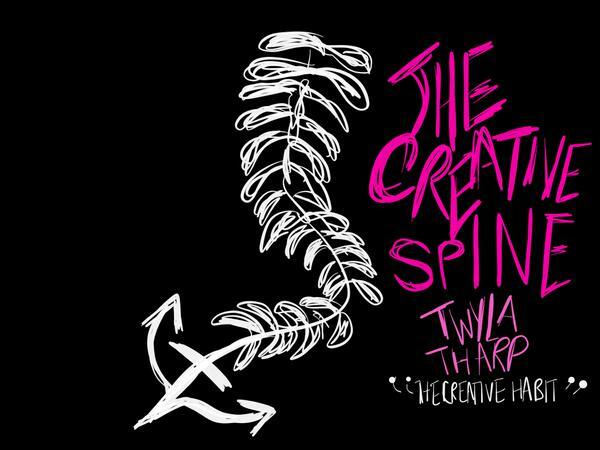 Tharp, Twyla. The Creative Habit: Learn It And Use It For Life. 2003. New York. Simon and Schuster. In education, we are in the midst of confronting and engaging in some of the most massive shifts and changes across the learning landscape that we may have ever faced. Much of which has been accelerated exponentially due to the advances of technology, both in education and society as a whole. Altering current expectations and skill-sets of today’s modern educator, often requiring major transformations in how they impart learning, as well as extracting their own learning and professional development. As we move forward in this new world, there will be many paradoxes that we will come face to face with that will require new ways of thinking, new ways of doing and new ways of leading. Being more creative while still facing a variety of stakeholder expectations. Being more innovative under current accountability systems. Learning and implementing new strategies and technologies in the midst of standards and curriculum changes. It will require new ways of leading. Be assured, we will be unable to initiate and scale the type of creativity and innovation necessary to face these shifts and changes at any type of scale, until we take a long, hard look at leadership and the leadership skill-sets, knowledge and learning necessary to push education forward effectively into the 21st century. Inability or unwillingness to do this, will allow many of our leaders to remain both a hindrance and obstacle, often unwittingly, to forward movement and momentum. The mindsets we create, the cultures we establish, the organizations we build, ultimately revolve around people. At its very foundation, education is truly about relationships and connections, pure and simple. And when leaders don’t get this, when they struggle to comprehend this, when fail to see this as the focal point of their daily work, very little changes. If you want to lead change, you have to understand people. Talking about change is easy, getting people to see its value and come on board, difficult. Understanding creativity is easy, getting those in your organization to be more creative, difficult. Seeing the importance of moving forward and being innovative is easy, getting people to engage and adopt more innovative ways of working, difficult. Coming up with new, creative and innovative ideas, while important, is easy. Getting people to accept and adopt these new ideas, difficult. Leadership is not about things, it’s not about initiatives, or programs, or plans. It’s about people. And if you can’t move people, you can’t move forward. Being creative and innovative is not always a joyous proposition. Not only does it require daily dedication and perspiration to the work. It can often lead to mental isolation, especially when your ideas don’t conform to status quo and the current culture. Often leading to internal and external bouts of doubt and uncertainty. You will tend to spend long periods of time questioning your own thinking and ideas…determining if these creative revelations are irrational and illogical or progressive and innovative. And for these reasons, you need to search out your creative companion. The friend that is willing to give you the feedback that is often difficult, but necessary and needed. Not criticism that pulls you back, but honest advice that drives you deeper…with your ideas, your thinking and your work. Especially when doubt and uncertainty begins its slow creep into the creative process. Just understand, this creative companion is not easy to find. Many creatives search for years, even a lifetime, and never find that other person that pushes their ideas and thinking. That person that pushes them past the internal and external forces of doubt. But you know that person when you find them…just don’t let them go. We live in a time and age of incredible access. Access to ideas and thinking on a scale never before beheld or witnessed in our history. A time of immediate and instantaneous access on a global proportion. A fire hose of information, learning, thinking and data that can often overwhelm and disconnect, just as much as it engages and connects. Unfortunately, many are disconnecting as much for the deconstruction and disruption this connection is causing, as for the vast and overwhelming information overload that accompanies this connection. As much as we romanticize the new, it can be humbling and painful as it undoes the foundations and understandings that we have to come to rely and build our world upon. A time that is requiring us to aggressively reevaluate our thinking, our understandings, our ideas…what we learn, how we learn, and even who we learn from. Today’s mental architects understand the necessity of deconstructing, questioning, reexamining, and rebuilding, will be necessary to adopt and adapt in this fluid, dynamic, and ever-evolving change world that we’ve created. A time when ‘tried and true’ may no longer serve as the credo it has always been.